World War Two, seen by millions in groundbreaking movies such as Saving Private Ryan, Schindler's List and Pearl Harbour, is set to be "fought again", after the accidental destruction of many original pieces of paperwork depicting the conflict. The British Ministry of Defence, along with France's Ministrie de la defence, and Germany's Abwehrumlautministrie, have together decided that the best way to resolve the situation is to attempt to recreate all the actions, in order to replace the lost information. "It's been in discussion for a few years now. We're dreadfully sorry and all that, but we really have lost everything, with no chance of recovery. If we fought the war today, though, we could store everything digitally, which would be absolutely splendid. Yes, we really do think it's a very good idea, really. Yes." The planned re-enactment is set to take place some time in 2016, with France this time playing the role of Germany, and Barack Obama playing Hitler. Michael Bay has been touted to direct many of the battles. The second world war, or WW2 as some wags have called it, was fought across parts of Europe in the mid 20th century. 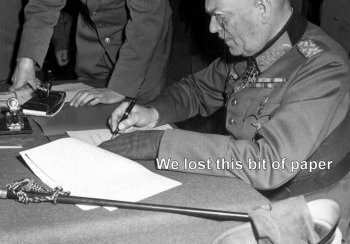 A few years after it started, Britain decided to fight Germany who had killed lots of people for no good reason, but couldn't immediately destroy the Nazi forces. Then America got involved and everyone was 'whupped' into submission. British company, Virgin, are said to be offering virgin training to their staff in, what sources have called, "a really weird move".